Each year, millions gather in Coney Island to watch the annual Fourth of July Nathan’s Famous Hot Dog eating contest. An event sanctioned by Major League Eating, self-proclaimed professional eaters spend a year preparing to consume as many hot dogs as possible within ten minutes. However, before the hot dog eating contests, Nathan’s Famous had a humbler beginning. One hundred years ago, Nathan Handwerker served his first frankfurter. Nathan was a poor Polish immigrant who arrived in New York in 1912 with little more than a dream for a better life. In 1916, using three hundred dollars he borrowed from two friends, Nathan started his business in Coney Island selling fresh pineapple, lemonade, and orange juices to thirsty tourists looking to cool off during a hot day. Nathan started selling frankfurters for ten cents, just like everyone else was doing. He knew his frankfurters were better than the others being sold. He made a conscious choice to only use high quality beef and season his frankfurters with his wife’s secret old world spice blend. His frankfurters were served on perfectly toasted buns. The husband and wife duo made a point to oversee every detail. In an effort to increase sales, Nathan made a bold move. He decided to cut the price of his frankfurters in half. He sold them for five cents. His strategy paid off. 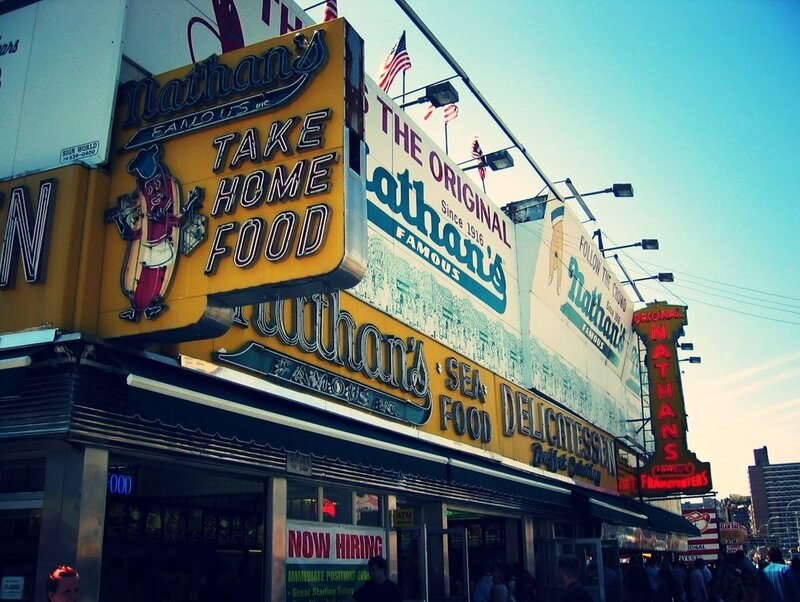 Nathan’s quality frankfurters coupled with affordability made his stand the busiest one in Coney Island. Nathan’s success is attributed to his passion and focus. He truly cared about his customers. Nathan’s passion and work ethic was shaped during his early childhood having lived in extreme poverty in Poland. After arriving in the United States, Nathan sought out employment at restaurants. He realized that a benefit of working in a restaurant is that you never went hungry. Nathan made the best use of these opportunities by inspecting all the ingredients and trying the variety of food these restaurants had to offer. Nathan committed to not raising the prices on his frankfurters for thirty years. He knew how important it was to offer quality food at low prices that was accessible to the masses. Today, Nathan’s Famous is no longer a family-owned business, but it continues to be successful and reminds us of several important higher education lessons. Coney Island Dreamin’: Nathan followed the footsteps of so many immigrants before him. He had a dream of a better life for himself and his family. He left his home country with no promises or guarantees. He faced life in a new land relying on grit and a hard work ethic. His dreams were realized with the help of a couple supportive friends and his wife. Students today also have dreams and aspirations of a better life. They enter higher education with expectations and needs. Despite life’s challenges and obstacles, students work hard in pursuit of their academic goals, they just need support along the way. Mo’ Money, Mo’ Problems: Nathan’s meager upbringing shaped his view of affordability and accessibility. He believed people deserved to have access to inexpensive, quality food. While his competition focused on charging ten cents for frankfurters, he made a strategic choice to cut his prices in half. Nathan understood the pains of hunger and poverty. He understood the needs of his customers. No doubt, many other vendors mocked his choice; however, Nathan’s convictions built brand loyalty. Higher education is challenged to meet affordability and accessibility needs largely due to a misperception of the target student population. Jamie Merisotis, President and CEO of the Lumina Foundation posed this question at The Aspen Ideas Festival, “What percentage of students in American higher education today graduated from high school and enrolled in college within a year to attend a four-year institution and live on campus? Most people guess ‘between forty and sixty percent’, whereas, the correct answer is five percent.” This answer is surprising while providing insight into the problem. There is a general lack of understanding about who higher education is really serving. If we are unable to identify our target student population, how can we hope to effectively serve them? I Won’t Back Down: For thirty years, Nathan continued to sell his frankfurters for five cents. He faced ongoing pressure from his vendors who insisted on increasing the costs for his quality ingredients. Nathan did not back down. He was committed to providing his customers with quality they could come to expect and rely on. Nathan built a successful brand because of his unwavering commitment to providing consistent value. Higher education is facing a brand loyalty problem. Once the envy of the world, American higher education has suffered from a perceived lack of value. From employers to students, people are questioning the quality of the education earned compared to the increasing monetary investment. Higher education has an opportunity to change the narrative by exploring alternative delivery models, maximizing technology, and reviving its initial purpose, to educate the citizens of tomorrow. So, the next time you reach for a package of Nathan’s Famous, remember the humble past of a Polish immigrant who was shaped by poverty, fueled by a dream, and redefined brand loyalty. A man of meager beginnings who taught us the importance of walking in another’s shoes. Only in America can an annual hot dog eating contest remind us that we all are shaped by our experiences and our success is defined by how we treat others.